Let the Beats (Music) drop. Well, almost. "We're nearly ready for liftoff," wrote company honcho Ian Rogers in revealing the Beats by Dre-backed streaming music service will launch in January 2014. That's only in the US, but it's a release, to be sure. The announcement falls right in line with news from October that the Spotify rival would arrive "within the next few months" stateside. Beats Music, run by music biz kingpin Jimmy Iovine, will curate songs via algorithm and human curation, a combination COO Luke Wood said creates "a perfect harmony between the algorithm and human curation. Between the man and the machine." The service is expected to stream from the web as well as through iOS and Android. Windows 8 support is supposed to come sometime later. To pass the time until that still-unspecified January date, future Beats Music users can register their usernames right now. 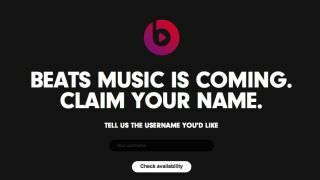 Users can reserve their preferred handles at BeatsMusic.com, avoiding the whole awkward mess of tacking on meaningless numbers in a effort to kind-of, sort-of have the username they'd like. We're looking at you, @mfitzsi333333. Rogers wrote that while the company had hoped to launch the service before 2013 was up, the team was "more concerned about getting Beats Music right than pushing it out the door." We've asked the company for details on a global release and will update this article if we hear back. The username reservations appear open to non-US residents, as the option to include a US telephone number isn't required. 'Hey! We're launching next year too!' - YouTube's subscription music service.